Wake up early and pop this Easy French Toast Casserole into the oven for a delicious homemade breakfast! 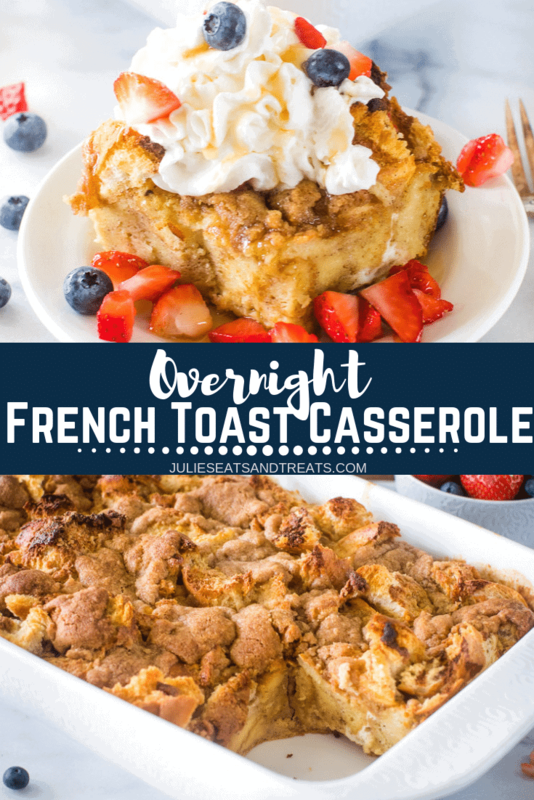 I love the fact this is an easy Overnight French Toast Casserole Recipe so I can make it the night before and sleep in the next morning! You can’t beat this breakfast casserole! As you all know quick and easy is my way! I love breakfast, especially overnight breakfast casseroles. As much as I love serving it at breakfast time, it also makes a great dinner! It’s so easy to whip up that it makes a perfect dinner and it’s delicious! Plus, it’s fun to do it at night for mixing things up and being in a rut is not what we want right?! 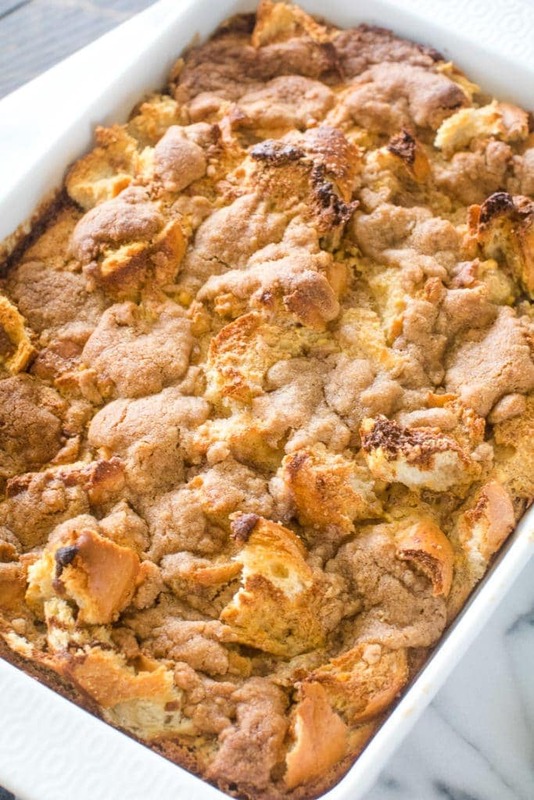 My kids love this easy French Toast Casserole. In fact when I served this my oldest daughter ate three pieces and was begging for it for snack before bedtime. I cut her off, but I promised to warm her up a piece for breakfast the next morning. I love that this French Toast Casserole reheats great! Can you make French toast the night before? Absolutely, this easy French toast casserole is best when made several hours before, preferably overnight! Make it the night before and tuck it into the oven the next morning. Breakfast is delicious and it’s a breeze to make! Is French toast supposed to be soggy inside? Soggy no – creamy yes! The outside of this casserole should be golden brown and crisp, the inside creamy from the custard. 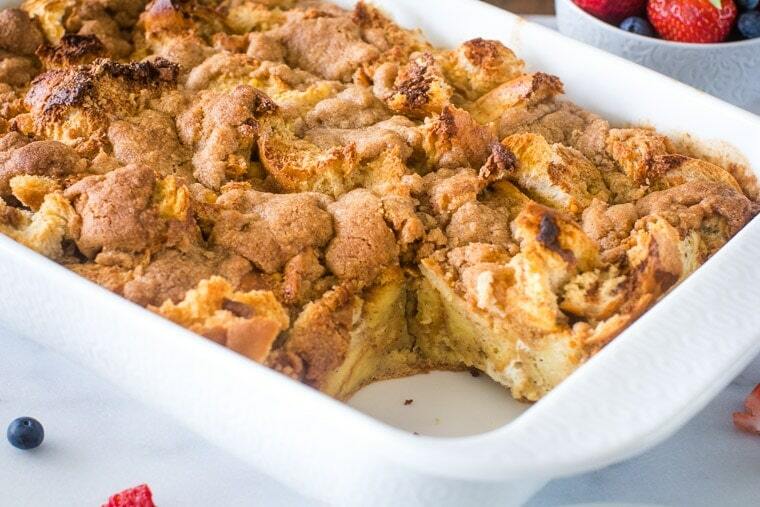 My family LOVED this Overnight French Toast Casserole. I couldn’t believe my oldest child and her obsession. She’s begging for it every night now! 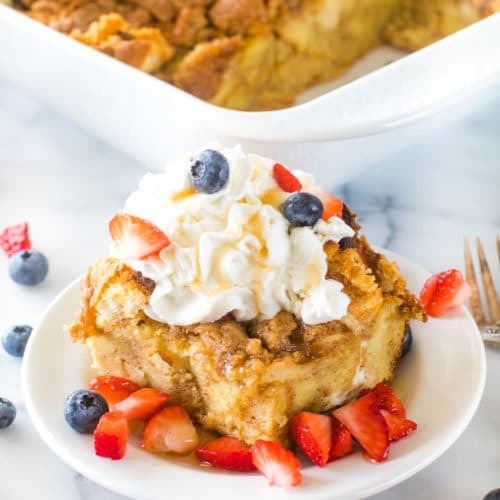 If you are looking for a simple meal for dinner and want a fun twist on it this Overnight French Toast Casserole is perfect. Whip it up the morning before you go to work and pop it right into the oven when you get home, then of course put your legs up and relax as your kids run around like crazy people! Wait, is that only me? Why does my french toast come out soggy? If it comes out soggy, there’s too much egg in the mixture. The French Toast should be firm but creamy in the middle with a crisp, slightly crunchy edges, golden brown and delicious! Can you save French toast batter? You can save the batter up to a day, but the beauty of this make-ahead casserole is you don’t have to! What is the best way to reheat this casserole? Cover the dish with tin foil and tuck it back into the oven for about 30 minutes or until it’s hot – you’ll know when it’s done because you can smell the deliciousness! It will be best to reheat it in the oven, though you can certainly pop it in the microwave in a pinch. Layer bread in the dish. Whisk together eggs, milk, whipping cream, cake mix, cinnamon and vanilla, pour mixture over the bread. Cover with foil and store in the refrigerator overnight. In a separate bowl add flour, brown sugar, cinnamon and salt – stir until combined. Mix in I Can’t Believe It’s Not Butter! to mixture. Store in fridge overnight and several hours. See told you it was easy to make! It’s just as easy as this classic French Toast recipe! Your family or guests will be so impressed when you whip this out of the fridge in the morning, bake it to perfection and spoil them! What bread makes the best French toast? Some of my favorites are – sourdough, challah, brioche and French bread. For this recipe I like sourdough. It holds up nicely and bakes perfectly delicious! Ok – are you ready to make this easy recipe? I bet you are! This meal is perfect for breakfast, lunch or brunch! And as I’d mentioned earlier, my daughter ate it for dinner too – it’s a favorite! Easy to make and simply delicious! More French Toast Recipes you’re sure to love! 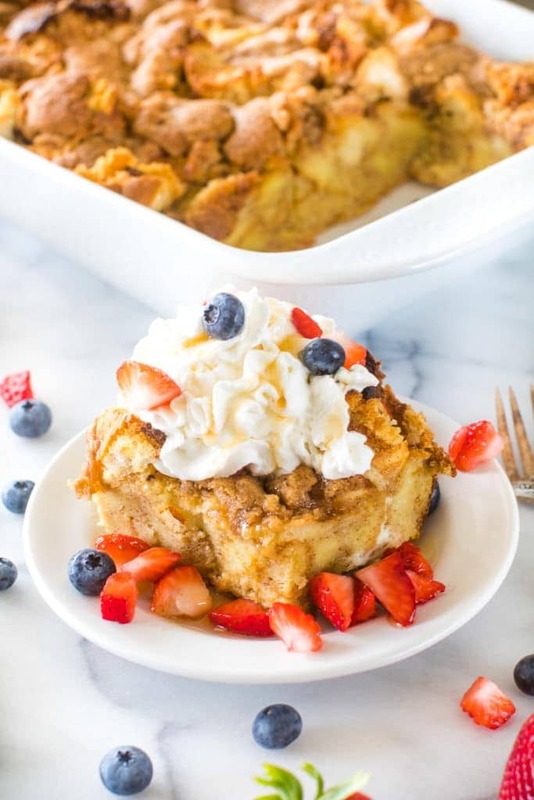 Wake up early and pop this Easy French Toast Casserole into the oven for a delicious homemade breakfast! I love the fact this is an Overnight French Toast Casserole Recipe so I can make it the night before and sleep in the next morning! You can't beat this breakfast casserole! Layer pieces of bread in baking dish. In a small bowl add flour, brown sugar, cinnamon and salt, stir until combined. Mix in I Can't Believe It's Not Butter! to mixture. Store in fridge overnight and several hours. I love breakfast recipes that can made ahead. This one is just perfect! Cake mix? Oh my gosh. No wonder this is so good! My kids would LOVE this! Everything is delicious when cake is involved right?! We welcome anything to make our mornings easier! 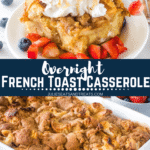 Overnight french toast casseroles are a staple for busy holiday mornings at my house! Can’t wait to try yours!! My house too! One of our favorites! This is so good! I made if for Saturday brunch and everyone loved it! Yum! It’s a perfect brunch recipe!